Click on form to enlarge! An enrollment form may be picked up from your child's school, City Hall (Santa Fe), Texas First Bank, SFISD Administration Building, and Mark Kilroy Foundation. We did not post it on this blog and do not email out due to high volume, but the cover sheet that is posted here will give you an idea of which week your child might want to attend if 1-5th grader. (He or she should have already received one if they are in 1-5th grades unless they were absent on the day they were handed out, which was the week of May 11th). 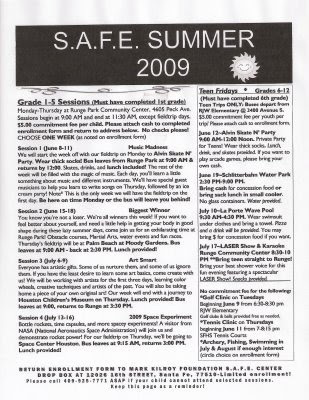 The teen information is on the right hand side of the cover sheet form, but you will still need an enrollment form, which can be picked up from one of the above places. Teens can sign up for all 4 fieldtrips, at $5.00/ea week. 1-5th graders may pick one week for $5.00 committment fee. This includes fieldtrips.